Lake Buena Vista, Florida (NEWS RELEASE) -- ABC's "American Idol" launches the start of its highly anticipated open auditions at Disney Springs at Walt Disney World Resort in Florida. 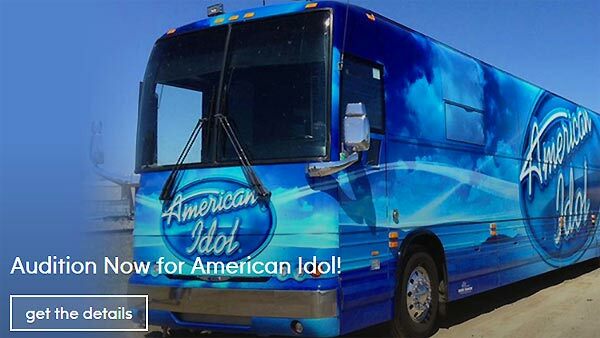 The iconic "American Idol" bus will roll into Disney Springs for auditions taking place on THURSDAY, AUGUST 17. "Idol"-winners Jordin Sparks, Kris Allen and Ruben Studdard will make a special appearance and greet lucky audition participants during the kickoff celebration of the search for America's next superstar. When the bus rolls away at the end of the day, Central Florida hopefuls will still have the chance to become a part of "Idol" history by auditioning via the "American Idol" pop-up audition kiosk, which will be at Disney Springs on FRIDAY, AUGUST 18, through FRIDAY, SEPTEMBER 15. During regular Disney Springs operating hours, visitors can create and submit their very own audition video at the kiosk. Auditions will simultaneously kick off on the West Coast in Portland, Oregon. Please visit www.americanidol.com for more information and specific audition details, locations, full eligibility requirements, submission forms, terms and conditions. "American Idol" is produced by FremantleMedia North America and 19 Entertainment, a division of CORE Media Group. Executive producers include FremantleMedia North America's Trish Kinane and Jennifer Mullin, along with co-executive producer Megan Wolflick. FremantleMedia International distributes the series worldwide. ABC Entertainment airs compelling programming across all day parts, with current hits including groundbreaking dramas "Designated Survivor," "Quantico," "Scandal" "How to Get Away with Murder," "Grey's Anatomy," "Marvel's Agents of S.H.I.E.L.D." and "Once Upon a Time." The ABC Television Network is also home to the Emmy-winning "Modern Family" and trailblazing comedy favorites "black-ish," "American Housewife," "Fresh Off the Boat," "The Goldbergs," "The Middle" and "Speechless"; hit game shows "$100,000 Pyramid," "Celebrity Family Feud," "Match Game" and "To Tell the Truth"; reality phenomenon "Shark Tank," the iconic "Bachelor" franchise, long-running hits "Dancing with the Stars" and "America's Funniest Home Videos," and the return of "American Idol"; "General Hospital," which has aired for over 50 years on the network, along with daytime talk show "The Chew"; and late-night talk show "Jimmy Kimmel Live." The network also boasts some of television's most prestigious awards shows, including "The Oscars," "The CMA Awards," "The American Music Awards" and "The Billboard Music Awards." Disney Springs is a one-of-a-kind retail, dining and entertainment district located in the heart of the Walt Disney World Resort in Florida. With its namesake springs, beautiful open-air promenades and lakefront setting, Disney Springs evokes the charm of Florida waterfront towns at the turn of the 20th century. It's also home to a collection of more than 150 shops and restaurants, including top-name retail brands, specialty boutiques and dining experiences created by celebrity and award-winning chefs. Located in Lake Buena Vista, Fla., Disney Springs is open daily. FremantleMedia North America (FMNA) is the U.S. arm of global media giant FremantleMedia, which includes a distribution arm, FremantleMedia International, a digital and branded entertainment division and a kids & family entertainment business. As one of the world's largest and most successful creators, producers and distributors of TV brands in the world, FremantleMedia's comprehensive global network has operations in 31 countries, creating over 10,000 hours of programming a year, rolling out more than 45 formats and managing over 350 individual titles. The company also distributes more than 20,000 hours of content in over 200 territories. For more information follow us @FMNATV and visit our Facebook page. CORE Media Group (CMG) is a leading independent media and entertainment company that creates quality programming for linear television and digital platforms through its in-house creative team, as well as a myriad of partnerships with well-established industry leaders including Sharp Entertainment and B-17. Through CMG's19 Entertainment, it co-produces "American Idol," the gold standard of music competition programs, and the enduring franchise, "So You Think You Can Dance" (returning on FOX for a 14th season). CMG's 19 Recordings has been a part of the successful music careers of platinum artists Kelly Clarkson, Carrie Underwood, Daughtry and Colton Dixon, just to name a few. The newest television series under the CORE umbrella include "The Wall" for NBC and "Caraoke Showdown" for Spike.